This week was a milestone in my career with EMC, hitting the 10 year mark on Monday Feb 17th. I thought it definitely deserved a day off for me (something about a President’s day for others that also took the day off…). Would be interesting to reflect on the last 10 years. Given we live in a world of real-time outcomes and social media, I am not going to attempt to reflect on the journey it’s been, but rather continue to look forward. One thing I have learned from great leaders at EMC is to push the envelope and attempt to be a change agent, which I am incredibly grateful for and will continue to do. I will admit though, although I have always believed in challenging the status quo for valid reasons, I also like to have fun (doing the same thing all over again is just plain boring!). I think the main reason I am still with EMC after 10 years (through EMC ups and downs) is that I am having fun at EMC, especially with my friends in the #SAPPosse! Spending 6 ½ years in direct sales as an AE (Commercial & Enterprise orgs) as well as a Global Account Manager and now over 3 years in our Global SAP practice in a client facing role have been very rewarding. Staying close to our SAP client’s requirements, challenges and initiatives gives you a perspective of reality, which I believe is necessary to be relevant. Now what’s really cool in the last few years is that social media, with tools like Twitter, gives you an opportunity to stay close even without face-to-face interaction. Social gives you a communication vehicle with no boundaries which is just awesome! Some of my friends at EMC and in the Ecosystem sometimes joke that it’s easier to reach me on twitter than email…what some people don’t get is that it’s true. I probably miss 100+ emails per week. Way more productive to communicate in real-time using 140 characters or less. One day perhaps others will realize this and email will be for dinasours. 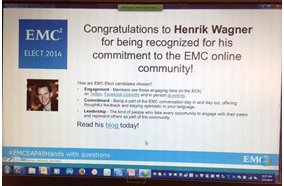 One interesting reflection from earlier this year in 2014 was that I was incredibly fortunate to get nominated by peers and inducted to the EMC Elect class of 2014 which is a community of Social EMC evangelists. For those who don’t know the EMC Elect community. Check out it out. It may not be appropriate to say this, but being recognized by my peers to the EMC Elect community means more to me than reaching a 10 year milestone with EMC. I was just fortunate to attend SAP’s Sales kickoff for APJ (in Singapore) and Americas (in Las Vegas) in the last few weeks. Let’s just say it gave us a ton to think about in the SAP & EMC relationship. The “Imagineering” has been hitting a max rating for me since and you can expect more cool things to come. Especially around Big Data for SAP client. There is no secret that the opportunity to drive better insight from data for business outcomes is Massive! Stay tuned on this with our Project Jupiter Platform. Catch me on twitter, or join us in 2014 somewhere in the world using our SAP Travel Guide!